Dhaka, 2 May, Abnews: Prime Minister Sheikh Hasina yesterday came down heavily on a section of labour leaders for their ill efforts to defame the country by lodging complaints with foreigners and asserted that there will be no benefit from it (complaints) as long as she remains in power. "As as long as I remain in (state) power, there will be no benefit from lodging complaints with anybody of the outside of the country ... I'm the daughter of the Father of the Nation and I run the state by loving the country and its people," she told the inaugural function of May Day at Bangabandhu International Conference Centre here yesterday afternoon. The premier added: "Our aim is to uphold the country's independence which was earned in exchange for blood of three million martyrs as well as uphold the dignity of the country and the countrymen on the world stage ... we will move ahead keeping our head high not bowing to others." The Ministry of Labour and Employment organized the function with State Minister Mujibul Haque Chunnu in the chair. Chairman of the Parliamentary Standing Committee on the Labour and Employment Ministry Munnujan Sufian, Bangladesh Employers Federation President Qamran T Rahman, Bangladesh Garment Manufacturers and Exporters Association (BGMEA) President Siddiqur Rahman, Jatiya Sramik League President Alhaj Shukkur Mahmud and International Labour Organisation (ILO) Country Representative in Bangladesh Gagan Rajbhandari also spoke on the occasion. Labour and Employment Secretary Afroza Khan gave the welcome address. The prime minister said it is unfortunate that there are some labour leaders in the country, whether they work or not, can make the guardianship on the workers. "If anything happens in the country, they lodge complaint with foreigners and get facilities like (air) tickets and staying abroad while going to undermine the country," she said. "For this little facilities, they tarnish the image of the country and they cannot understand that how much harmful it to the country ... it's the most unfortunate matter," she added. 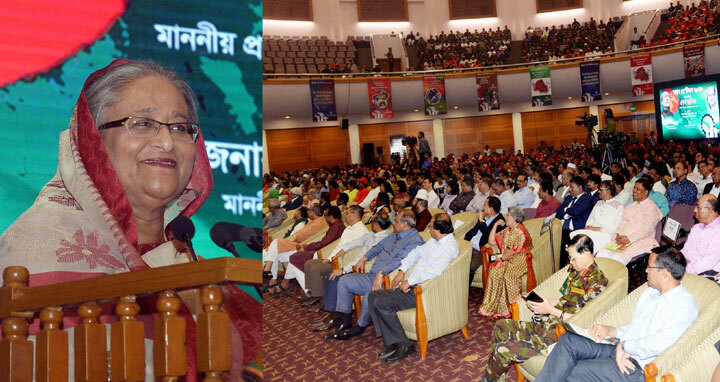 Sheikh Hasina said the country is ours and all must have patriotism to build the country. "As much as the country's economic uplift will be made, the welfare of the people will be made and their living standard will be improved to that extent," she said. The premier put emphasis again on maintaining cordial relations between the owners and workers to boost production in mills and factories and urged them to stay alert against any unrest in industrial units. "I want that cordial relations exist between the owners and workers ... mayhem starts with the instigation of anybody of the outside - such an incident doesn't happen," she said. Sheikh Hasina said the workers will have to give special attention so that the factories through which they earn bread and butter are not destroyed. "You'll have to give attention so that no unrest is created in your factories which manage your income and food," she said. In this connection, the premier advised the workers to keep confidence in her and said: "I'm with you if you face any trouble ... it's my responsibility. I didn't come to power to change my own fate, I have come to change your lot. I will look into your problem." The prime minister also asked the owners to be more sincere towards the working class people. "You'll have to be more sincere and cordial towards the workers through whom you earn money, do business and your family stays well ... you'll have to remain careful so that no shortage in your responsibility is made," she said. Pointing out the theme of May Day -- Malik Sramik Bhai Bhai, Sakale Mile Sonar Bangla Gorte Chai, the prime minister said the owners and workers will have to work becoming strength of each other. Terming the Awami League government as a government of working class people and toiling masses, the premier said her government always remains beside them. "Our politics is for the farmers and working class people and the country will advance further if their fate is changed," she said, seeking their cooperation for nation building. Sheikh Hasina said whenever her government came to state power, it established the rights of the working class people and toiling masses. "We ensured peace, production and development in industries and one of our commitments is to ensure rights and welfare of the working class people," she said. The prime minister said her government during 1996-2001 tenure had taken various measures for the welfare of the working class people and industrial development. During the period, she said, 1,06,777 small and big mills and factories were set up creating employment for lakhs of people. Sheikh Hasina said her present government implemented massive programmes for the working class people in the last nine years since 2009. The premier said the government has constituted Bangladesh Workers Welfare Foundation Fund for the workers working in different sectors and more than Tk 200 crore were deposited in the fund. "The workers engaged in any institutional or non-institutional sector are getting financial support from it," she said. By amending the Labour Law, Sheikh Hasina said, the government for the first time formed a central fund for overall welfare of the workers and employees working in the garment sector and the money of the fund is being spent for the welfare of the workers. The prime minister said her government has enhanced the minimum wage of the garment workers to Tk 5,300 from Tk 1,600. Sheikh Hasina said the government has introduced rationing system for the workers and constructed child care centres, hospitals and dormitories for the garment workers. "We've reopened the mills and factories that were shut down during the BNP-Jamaat rule," she said. The prime minister said her government framed the National Labour Policy, 2012 and Bangladesh Labour Rules, 2015 for ensuring welfare of the workers. Besides, she said, the National Professional Health and Safety Policy, 2013 and the National Skill Development Policy, 2011 were enacted, while the National Skill Development Council has been constituted for the human resource development. Sheikh Hasina said the government is setting up 100 special economic zones where employments for one crore people will be created. In this connection, she stressed the need for protecting farmland and urged the entrepreneurs not establish mills and factories here and there. "We will make industrialization, but not destroying agriculture land," she said. The prime minister advised those intending to go abroad with job to make online registration by maintaining the government rules. "Don't go to the brokers, the government is giving all kinds of cooperation to you," she said. She reiterated her determination to build Bangladesh a middle income country by 2021, the golden jubilee of independence, and developed and prosperous one before 2041. At the outset of her speech, Sheikh Hasina extended May Day greetings to the working class people across the world including Bangladesh and expressed solidarity with them. She paid profound respect to the memories of those who embraced martyrdom for establishing fundamental rights of the working class people in Chicago in 1886. The prime minister also paid tributes to Father of the Nation Bangabandhu Sheikh Mujibur Rahman and said the Father of the Nation struggled his entire life for realizing the rights of the exploited, deprived and working class people. Bangabandhu had established the rights of the working class people in articles 14 and 19 of the Constitution to build a exploitation-free society, she said. The premier said Bangabandhu enacted the Labour Policy in 1973 and nationalized mills and factories, banks and insurances to strengthen the economy of the war-ravaged country. "He (Bangabandhu) also formed the wage commission and declared public holiday on the May Day," she said. Earlier, Sheikh Hasina handed over cheque for financial assistance to two wounded workers, wives of four workers killed at workplaces and meritorious children of four workers.